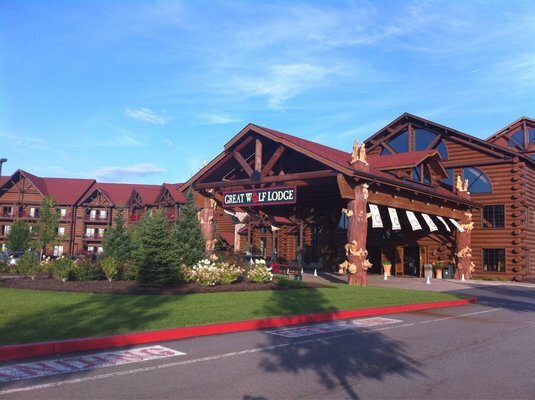 I decided to take my wife away for a nice romantic weekend to the Pocono Mountains in Pennsylvania. They have some fantastic resorts in the middle of nowhere that really allow you to just get away from it all and relax. With our daughter Hanna quickly approaching the “terrible two” we thought it would be nice to spend some time together just the two of us. Not to mention that grandma is always looking for an excuse to spend more time with Hanna. 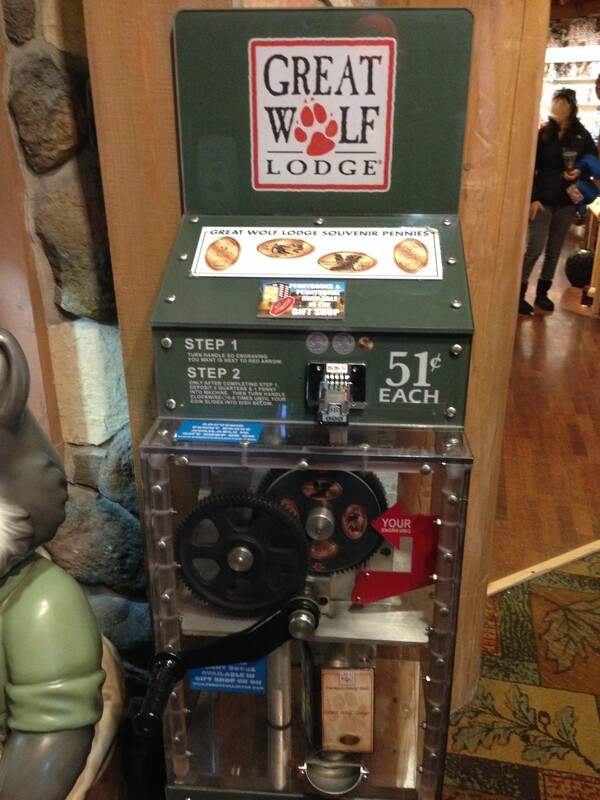 Little did my wife know (although by now she must always know) I found there was a new penny machine located in a place called Great Wolf Lodge. 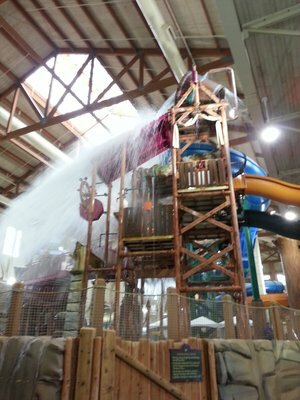 I’d never heard of this place before, but their website listed numerous locations across the country and best of all each resort includes an indoor / outdoor water park. As much as the kid inside me would have loved to spend out weekend at this resort we ended up just stopping by to visit and check this place out. First of all wow, it was huge and the theme was amazing. There were fuzzy characters roaming around and interacting with all the children and some adults that were young at heart. We strolled through the reception area just overwhelmed by all the little details we were seeing, and eventually headed into a large gift shop. Just like any other resort gift shop there were tons of items for sale. T-shirts, hats, license plate frames and plenty of candy to keep the kids hyper enough to spend the entire day splashing down water slides. Right outside the gift shop we came face to face with a huge viewing window that allowed us to look upon the water park. There was a wave pool, sprinklers, and slides that started inside, went outside and then ended back inside the building. We stood there open mouthed as we watched all the different activities going on. After the initial amazement wore off I started to remember my primary reason for wanting to visit, there was a penny machine somewhere in this place. I was worried that it may end up being located in an area that was only available to resort guests and was about to ask a staff member when I heard a familiar sound. The repeated clink, clink, clink of a penny machine being cranked. It was close by and my radar starting going wild. My wife rolled her eyes as my head perked up like a Meerkat on the alert as I started moving towards the source of the sound. Along one of the outside walls of the gift shop I saw it. 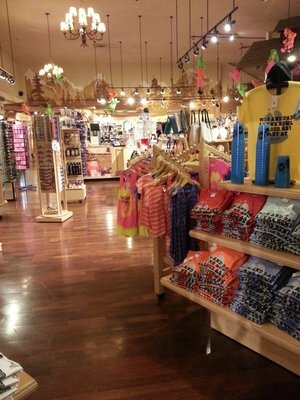 I hadn’t seen it due to our extended trip through the gift shop originally. The kids that were using it when I first heard the magical sound were done and I quickly jumped to the machine and pressed my pennies. The designs came out great. I always like when these resorts list their location on the designs which help make them more unique and distinguishable from their other locations. 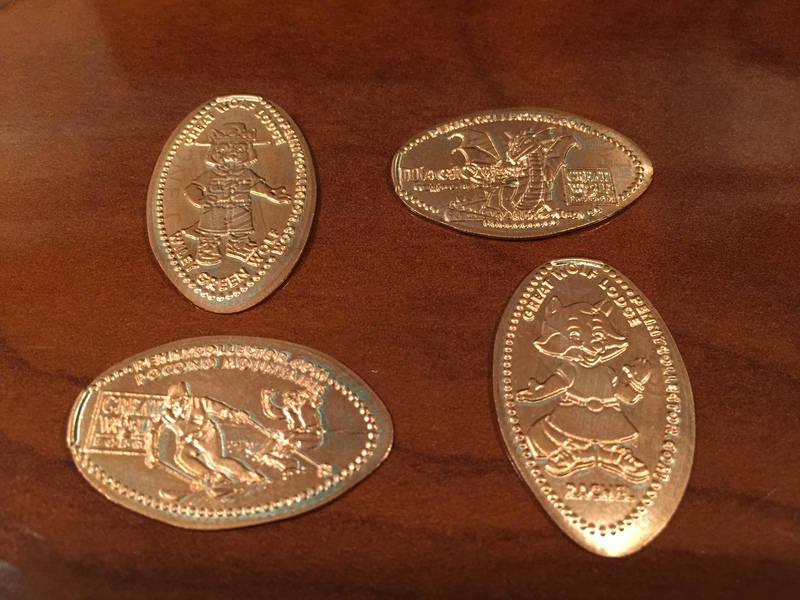 The machine had four designs: Wiley Green Wolf, MagicQuest Dragon, Pocono Mountain Skiers, and Rachel Wolf. This place was definitely a fun side trip. Luckily we are only a few hours away and will be back to check this resort out as actual guests. I heard murmurings of an indoor mini-golf course and need to know more about the MagicQuest that had kids running around with wands in hand. The pennies were great and was the cheapest souvenir I picked up that day, and will make a great addition to my collection.